The classic raglan t-shirt. This USA made shirt is a stylish option for everyday wear for both boys and girls. 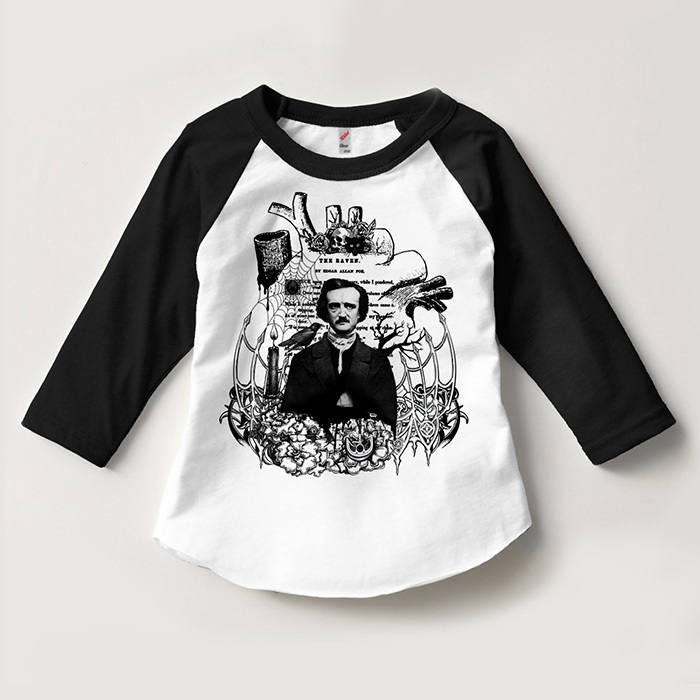 This lightweight raglan kids shirt features a design and drawing of mine based on a vintage engraving of Edgar Allan Poe. Sizes available: 2, 4, 6, 8, 10 and 12. Little to no shrinkage. Consult size chart for sizing. Raglan History: The Raglan sleeve design was named after FitzRoy James Henry Somerset, the 1st Baron Raglan who wore this style of coat after losing his arm at Waterloo. The classic raglan shirt. A great fit for both boys and girls. Lightweight and soft. 3.7 oz, 50% 50% poly and combed ring-spun cotton. Durable neck binding, hemmed arm openings and overlocked bottom hem. Contrasting collar and sleeves with raglan 3/4 sleeves. 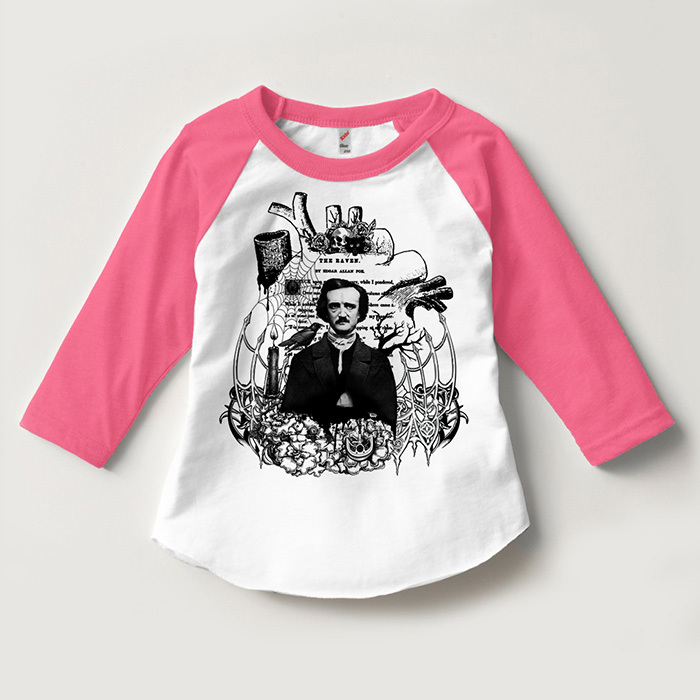 Stylish, flattering unisex fit that looks good on both girls and boys. Brand: Los Angeles Apparel. USA made and sourced. Sweatshop-free and employee-owned. Colors: Black Sleeves, Red Sleeves, and Pink Sleeves. Kid sizes Toddler and Youth - 2, 4, 6, 8, 10 and 12. Little to no shrinkage. 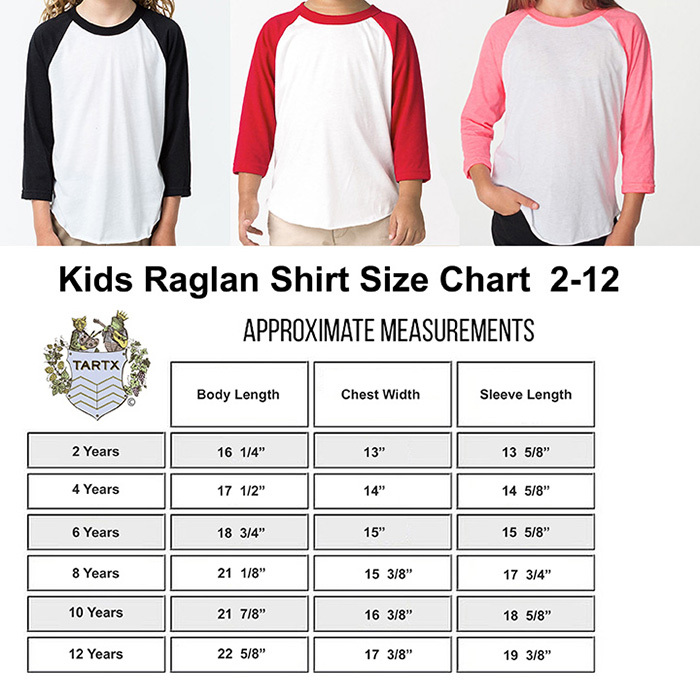 Consult size chart for sizing. Image size will vary depending on the shirt size. We love Poe's poetry. It's amazing to read his poetry in anthologies of poetry from his time. You feel like you could be reading poems from writers a century apart from each other. His poetry always feels modern. He creates such visceral feelings through his stories. This illustration was inspired by a series of collages I did a few years ago that had elements handcut from 3 or 4 different discarded and damaged books. It is a piece that has grown on us over time. The raven never left Poe so it is fitting that it sits here on his shoulder forevermore!